You'll be £25.00 closer to your next £10.00 credit when you purchase Lost Honour, Betrayed Loyalty. What's this? 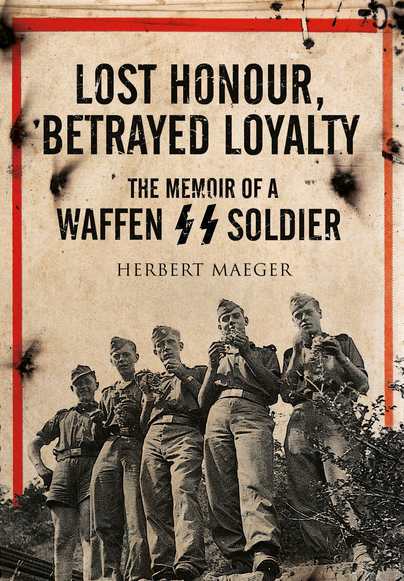 This is an unrivalled account of one man's service in the elite Waffen-SS Leibstandarte division, principally on the Eastern Front. The author, an 18-year old Belgian, was blackmailed into volunteering for the Waffen-SS in 1941 to save his mother from a concentration camp. After enduring the MG harsh training with the Leibstandarte SS Adolf Hitler (considered by some to be a worse experience than the fighting front), Maeger went on to be selected as a frontline driver in Russia. He saw combat at Kharkov and at the legendary battle of Kursk. In 1944 he was transferred out for training as an SS paramedic, but after two months was sent against his will for SS-officer training. Overheard making a defeatist remark, he was sent to the notorious SS penal division Dirlewanger on the Oder front, where he survived the horror of the Halbe pocket. Maeger was a Belgian national who in 1941 was conscripted into the SS at the age of 18 in order to save his mothers deportation to a concentration camp. He eventually found himself reporting to the Lichterfelde Barracks in Berlin as a recruit into the famous Liebstandarte SS Adolf Hitler, who performed the function of being Hitlers bodyguard providing security at his offices, residences and at state occasions. As war became imminent, Hitler ordered they be turned into an Infantry Regiment. Maeger’s experience of his time in barracks somewhat dispels the myth that they were well led Ayran supermen as the conscripts were often the victims of terrific abuse by their instructors, themselves veterans of the peacetime cadre that had joined the division on idealogical grounds as opposed to the conscripts who were instructed which unit they were to join. The training regime was designed to break the conscripts down into fanatic followers of Hitler prepared to sacrifice themselves in the way that the volunteer cadre had done in Poland, France & Russia. Upon the completion of his training, he was sent of to Russia to endure the pitiless winter of 1941 where he had to work hard to earn the respect of the Officers and men that had been fighting hard since the start of the Barborossa campaign in June. Welcome respite came in 1942 when the unit were shipped back to France for rest and refitting, but the stay was short as they were once again shipped back off to Russia to endure another punishing winter. As they were departing, Maeger was offered the chance of being a driver which he took and became part of the ‘fighting Tross’ (the company baggage train) who brought up food to the front line and delivered casualties rearward. From there he went on to take part in the battle of Kharkov, received a wound at Kursk and then with the LSSAH division was moved to Italy to help prop up the collapsing front. Now a veteran soldier, he was offered the chance to attend SS Officer school but declined out of a preference to go into medicine. After a period of recuperation due to the untreated wound received at Kursk, he began his medical training only to be overheard making a defeatist comment which eventually led him to the infamous SS-Dirlewanger Brigade (a punishment battalion) where he served as a paramedic and anaesthetist in the operating theatres on the rapidly collapsing Eastern front. He escaped the Halbe pocket and made his way West eventually being captured by Russian forces on 1st May 1945 near the Elbe River and from there went into POW camp, luckily missing selection for transport to the Gulags of Siberia. He saw the rest of his internment out as a volunteer in the Infirmary earning the respect of a Russian doctor who secured his early release. A convincing piece of work by a Waffen SS soldier who was born in Belgium and fought in Hitler's premier fighting unit, chiefly in Russia. Maeger is a talented and largely forthright author, a man who constantly refers to his dual nationality throughout this book... The book is another important title, to learn about the trials and tribulations of the German soldier in WW2, enjoy! Incidentally, the book is very well illustrated. Herbert Maeger was born at Hergenrath/Eupen in Belgium on 10 November 1922. After release from Soviet captivity in late 1945 he settled in West Germany in the Rheydt area and began pre-clinical training. He obtained German citizenship on 21 June 1971. He was unable to return to Belgium for decades after the war, having been sentenced to life imprisonment in his absence by a military tribunal at Verviers on 19 February 1947 ‘for having borne arms against Belgium's allies in particular as a member of the Waffen-SS.